One year ago – on a whim – I tossed a Pilot Petit 1 fountain pen into an order of pen I refills. I had been leery of fountain pens. They seemed expensive and messy, and I knew nothing about them. But the Petit 1 only cost $3 – the perfect price for an impulse buy. So I bought my first fountain pen – and loved it. The Petit 1 is cute, inexpensive, not messy or hard to use, and – most important – writes well. I was smitten. I loved my Petit 1 and quickly began to wonder what else I was missing. I fell headlong into the fountain pen hole. I had a lot to learn about fountain pens and I dove in. Of course, my fascination with pens soon turned toward ink. My growing collection of pens wouldn’t work without ink. I found the options for ink to be even more confusing than pens: waterproof, water resistance, pigmented, permanent, lubricated, freeze resistant, fast drying, fluorescent. Some inks are some combination of these qualities; other inks are none of them. How is a newbie to figure this out? 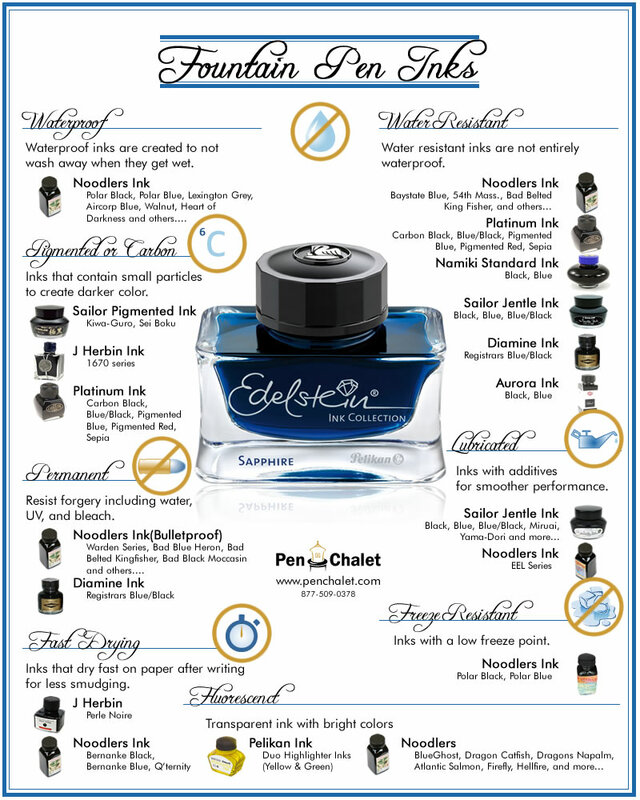 Ron at Pen Chalet has put together a helpful infographic that groups fountain pen inks by key qualities. Check it out. I wish I had this infographic a year ago. I’m glad to have it now.